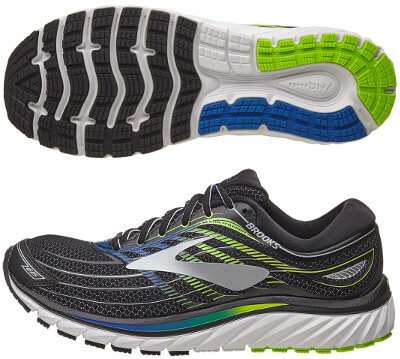 Brooks Glycerin 15 are neutral cushioned running shoes. The superb Brooks Glycerin 15 is one of the most comfortable shoe a runner can buy and high price tag matches expectation. Although pretty popular in the USA where is easy to find different widths to better fit big feet, the strong competition among premium running shoes in Europe is inclined to also expensive Asics Gel Nimbus 19. The Glycerin 15 features smoother transition with reengineered midfoot in outsole and aims to solve breathability issues with simpler upper while staying true to its soul with abundant soft cushioning and high quality components, a great option for neutral runners (allows custom orthotics) to enjoy long distances with great comfort, just an step above its smaller sibling Ghost 9. Apart from typical price rise, major highlight in current edition compared to its predecessor Glycerin 14 is the new upper where plastic piece wrapping the midfoot has been replaced with fused elements "3D Fit Print" to improve ventilation and provide a lighter but snug fit. Classical Brooks logo is made of reflective material to increase visibility under poor light conditions. The impressive midsole from Glycerin 15 keeps Super DNA foam for great cushioining with soft and comfortable feeling in a similar way its counterpart with pronation support Transcend 4 does. Grooves in midsole wall have changed their direction to better support heel strikers when landing. Also outsole design has been slightly modified by removing some rubber in midfoot for smoother ride and deeper, more winding grooves in forefoot to increase flexibility.